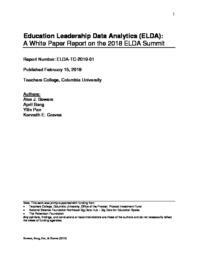 Education Leadership Data Analytics (ELDA) is an emerging domain that is centered at the intersection of education leadership, the use of evidence-based improvement cycles in schools to promote instructional improvement, and education data science. ELDA practitioners work collaboratively with school and district leaders and teachers to analyze, pattern, and visualize previously unknown patterns and information from the vast sets of data collected by schooling organizations, and then integrate findings in easy to understand language and digital tools into collaborative and community-building evidence-based improvement cycles with stakeholders. In June of 2018, over 100 participants gathered for the Education Leadership Data Analytics Summit at Teachers College, Columbia University in New York City, including researchers, practitioners, policymakers, and funders. This report provides a summary of the central issues, themes, and recommendations for the future of the field that emerged from the discussions at the ELDA Summit event. These issues include building capacity in the field through incentivizing researcher practitioner partnerships, and providing conference and networking opportunities, professional development, certification, and ultimately degree programs to train ELDA researchers and practitioners. Additionally, a central focus of the ELDA field is equity, data security and privacy, in concert with open and FAIR data standards to develop and share de-identified data and tools across contexts. We conclude the report with a blueprint of possible skills and competencies needed for ELDA practitioner training and professional development and provide recommendations for next steps to help grow the field. Keywords: education leadership, evidence-based improvement cycles, education data science, big data, data analytics, data driven decision-making, evidence use.